Nothing is painted, dyed, tinted or man-made. Stones that have been washed smooth by nature after many years. Available in a wide variety of sizes, shapes & colors. 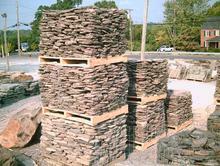 Stones cut into squares & rectangles for sidewalks, patios, steps, sills, mantels, hearths, table tops, benches, column caps & more. Stones for stacking or adhering to another surface in many different colors & textures. Natural shaped flagstones for sidewalks, steps, patios & more.